The last couple of days have been spent updating plans to Version N.
The swim meant that I’d need to move the fridge further down the galley. Wanting to keep the sink and draining area to a corner, this meant moving the fridge to the other side, swapping it for cutlery draws and a cleaning cupboard. It would still need to move further down the boat though. Slotting in a gap of just over 300 helped, it also gave me a home for one of our bikes. The other could live at the bottom of the wet locker. One bike gets used more frequently than both, so the second can afford to be tucked away a little bit more. Hooray, hopefully a solution. 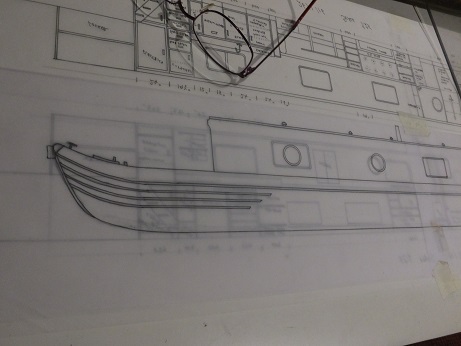 With the layout plan updated I finished off the port and starboard internal elevations, positioning the windows as I went. I then did an external elevation of both sides just to check that the positions looked well spaced and they do. With the plans copied and scanned they have been emailed to Ken and Julia. We are quite happy with the layout , but are hoping that we haven’t made any daft mistakes which would have knock on effects. We’ll wait and see what the reaction is to them. Then I couldn’t help but start on a scale model. A few years ago I made one of a 58ft cruiser stern NB Oleanna. She has now grown by 6 inches and is a semi trad so I have had to start from scratch. 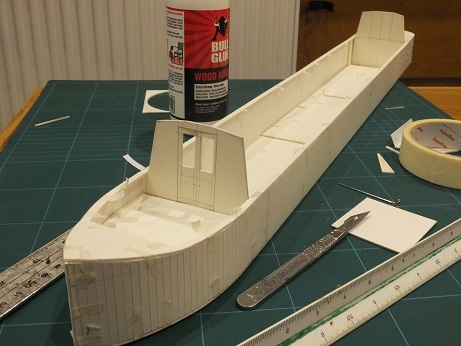 The bow and stern of the model won’t be accurate in shape. This is possible but would take longer to make and I don’t have the dimensions of a Tyler Wilson shell to build from so I’d rather a suggestion of the shape instead. I have wondered if there would be a market for such models when people are planning their boat layout. I could provide a hull and furniture that they could move around until they are happy. 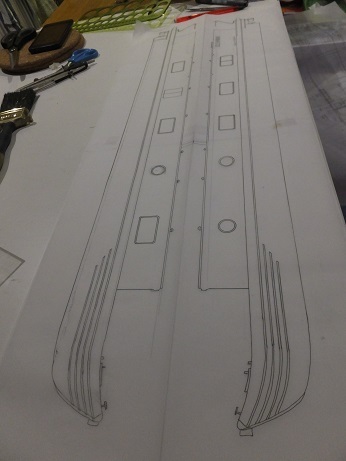 The model is made up to the gunnels and the bow and stern bulkheads are ready to go in. Until we hear back from Ken and Julia there isn’t much more that can be done. 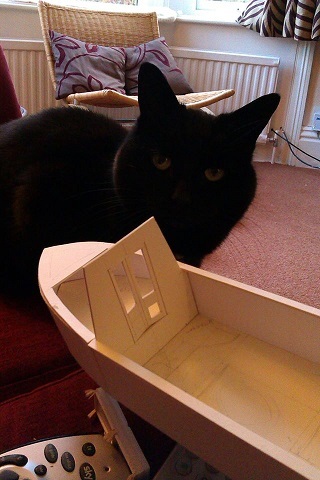 Houdini was concerned at the size of her cat flap on the original model. We will still have feline access, just need a new ships cat. This entry was posted in Uncategorized on 28th Jan 2016 by pipandmick.